"We'd like someday to be able to have a spacecraft create itself entirely from scratch, but realistically that's quite a ways out," said Robert Hoyt, CEO and chief scientist of Tethers Unlimited Inc. "That's still science fiction." The idea could also cut space mission costs and boost mission capabilities by making much lighter and larger structures in space, Hoyt explained. That's because space manufacturing avoids the need to make heavier spacecraft components that can not only stand up to Earth's gravity, but can also survive the shaking and acceleration of rocket launches. 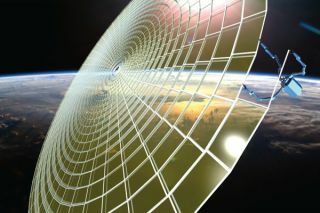 "The system could then morph in orbit into a very large system a dozen or hundreds of meters in size," Hoyt told InnovationNewsDaily. "It would be like launching a CubeSat that creates a 50 meter-length boom." Hoyt even envisions the space manufacturing technology building space telescopes the size of ARICEBO — a 1,000-foot (305-meter) telescope radio telescope in Puerto Rico. Or the technology could allow space probes to visit distant star systems and begin building sensor arrays and communications transmitters to send signals back to Earth. The technology might even build upon DARPA's Phoenix idea of scavenging parts from old or broken spacecraft to build a new Frankenstein satellite, except that the space manufacturing could break down both spacecraft parts and materials from asteroid mining. That futuristic vision will require a more intricate, automated cooperation between robot arms and 3D printing technology. "We're also working on robot arm systems, so we're hoping at some point to combine that project with our SpiderFab project," Hoyt said.